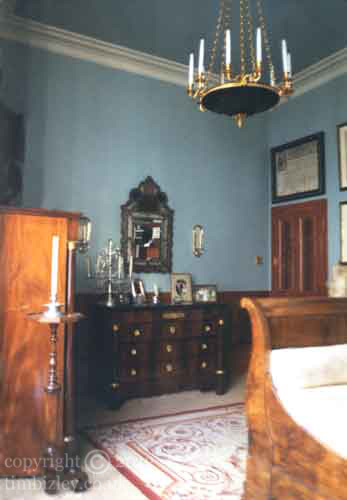 The doors, panelling, skirtings and fitted joinery in this interior were wood grained in mahogany to flow with the owners extensive collection of French Empire furniture and accessories. Wood graining is one of a number of traditional paint effect techniques employed by specialist decorators which can be used in the re-creation of the period interior and schemes of historic decoration. The use of authentic and traditional methods can greatly enhance the sense of authenticity in interiors which are requiring a feel for a particular period. The blue walls were finished in traditional paint and act as a suitable foil for the warm tones of the wood. Judiciously chosen accessories complete the look.